Yesterday was "Stir-Up Sunday" and I intend to celebrate. "Stir-Up Sunday" is the last Sunday before Advent starts. It is the last Sunday of the liturgical year. It gets its name because of the "Collect" prayer you say at the beginning, which on this particular Sunday starts with the words "stir up." The prayer starts out: "Excita, quaesumus, Domine," which means "Stir up, we beseech Thee, O Lord..."
It became customary over the centuries to take your cue from this prayer and stir up your Christmas pudding! You would mix it up and then it would mellow with brandy or whatever until Christmas. In response to "Stir-Up Sunday" I would like to make fruitcakes. They are not the yuchy desserts everyone thinks they are. 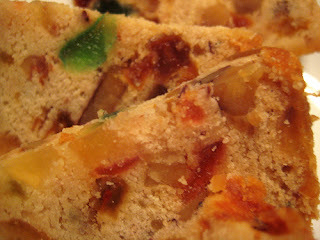 Fruitcakes are yummy! I did them a few years ago and even the little nieces and nephews were jockeying for extra slices. That was before I got involved with Leonard Pennario so I had time back then. I even made my own candied citrus peel, imagine that! I do not know if I will be able to micromanage my fruitcakes to such an extent this year. But I should be able to toss one or two together. It is fun because you bake it and then douse it in brandy or some other liquor every week until Christmas. That is an adventure! I remember going down in the cellar to douse these fruitcakes and saying, "I'll believe this when I see it." What got me baking those fruitcakes was, they showed up in Martha Stewart magazine, which in turn showed up on my doorstep. There were two that I made. One was the Dowager Duchess fruitcake. I loved that one! If you try only one fruitcake do that one. It is a pale gold with lemon and orange peel. The other fruitcake I made I cannot for the life of me remember. Well, that must mean it was good! Start on your Christmas desserts!